The senior boys’ team travelled to Dublin for a winner-takes-all clash with the Republic of Ireland. For the home side, the equation was simple – win and the Centenary Shield was theirs. For Scotland the arithmetic was slightly more complicated. Having played fewer games brought more permutations: basically avoiding defeat here would leave Scotland with a shoot-out of their own next Thursday against Wales at Palmerston. Reflecting the bright start to the campaign, the Scotland line-up contained only one change: Fraser Currid stepping in for the ill Elliot Anderson in goal. This confidence was mirrored in Scotland’s opening. Within three minutes Aidan McKeown had broken down the right to measure a neat pass to Gavin Scott, who in turn laid off to Daniel MacKay in the area. The Inverness man’s right foot shot couldn’t find the target, and danger for the Irish was averted. The home side pressed next, and Liam Kerrigan threaded the ball through to captain Cieran Murphy. The forward’s shot on the turn could not find the target and dribbled behind for a goal kick. Unfortunately this was but a temporary reprieve. In only the 5th minute of play Murphy turned provider: nudging a well-weighted ball to the pacy Ali Regbah, who slid his finish below Currid and into the Scotland net. This represented a body blow to the visitors, and there followed a sustained period of Irish pressure in contrast to the bright opening enjoyed by the Scots and a healthy travelling support. At the centre of all of this were the attacking triumvirate of Regbah, Kerrigan and Ronan Manning. Numerous attacks followed. Manning delivered a dangerous free-kick which was repelled by the head of Jack McDowall. The ball returned to Manning, who shot narrowly wide. Manning then caused McDowall to again look sharp, as his thoughtful pass almost found Murphy in the penalty area. After only 15 minutes of play the hosts made this pressure count with a lovely piece of individual play from Kerrigan. Kieran Farren’s slick pass found the attacking midfielder on the right side of the penalty area. From there he cut inside and guided a fine finish into the top corner. The Republic were enjoying themselves now, even though Jack Ryan found his way into referee Paul Norton’s notebook for pursuing a personal feud with Reece Rintoul in the middle of the park. A spell of head tennis in 19 minutes allowed the ball to fall for Murphy in the Scottish area, but the forward shot wide. A minute later Regbah found Kerrigan in the area, but his intentions were thwarted by Cameron Clark at the expense of a corner. The resultant kick was taken by Manning, flicked on by Darryl Walsh and nodded over by Murphy. Manning’s dead-ball prowess was again in evidence soon. McKeown was booked for a lunging challenge around 22 yards out. Up stepped Manning to curl a free-kick towards the Scotland goal, but the ball thudded against Currid’s crossbar and rebounded to safety. If this execution was meritorious of a third goal, the home side did not have long to wait to see it in reality. Neat interplay involving Murphy, Manning and Kerrigan found Regbah in the area. He rode two challenges before striking the ball home for his second goal of the game. The match then slipped into a little lull, before a superb diving save from Currid prevented Kerrigan’s deflected effort dipping into the net for a fourth home counter. Just before half time, Currid’s opposite number Daniel Houghton had to race from his line to swoop at Jack Hodge’s feet as Scotland attempted to rally. Scott’s ball had looked a good one, but the Irish goalkeeper was alert to the danger. On the stroke of half time Rintoul became the third player cautioned, as he renewed acquaintances with Ryan. HALF TIME: REPUBLIC OF IRELAND 3, SCOTLAND 0. This caution would prove to be Rintoul’s final involvement of the match as he, Hodge and Sam Walker were replaced at half time by Sean Fagan, Kieran Chalmers and Nathan Fell. This substitution almost had an immediate effect – Declan Walsh’s pass allowed MacKay to sprint into the area, only to be felled by Kieran Farren. Mr. Norton had no hesitation in pointing to the spot, but Scotland’s penalty hoodoo continued as Clark’s left foot kick was saved by Houghton diving to his left. This marked a change in the direction of play. Where Ireland had swaggered in the first half, they now wavered in the face of a Scottish onslaught. Clark twice found Fell in the area in quick succession. On the first occasion instant control permitted a clear sight of goal, but the shot was off target; on the second Fell’s effort was deflected past by Farren. Fell seemed to be involved in every Scottish attack. His thoughtful pass allowed an early strike from Chalmers which was fumbled by Houghton; Fell just failed in latching onto the re-bound. He had more success in the 62nd minute, as McKeown overlapped to send a deep cross which was knocked back across goal by MacKay to allow NATHAN FELL to dive to head home. Scotland strived for a second goal, and came close on a couple of occasions, whilst seeing goalkeeper Houghton performing resolute service in dealing with cross balls. Closest of all came MacKay who generated a great deal of power to head goal-wards from a Clark cross, but the ball flashed narrowly over the crossbar. It did, however prove to be beyond them, as Ireland’s whirlwind start left Scotland with too much to do after the break. As Scotland were by far the better side in the second half, it would have been cruel had Kerrigan netted a fourth for the Republic of Ireland following an astute knock-down from Murphy with five minutes remaining. The powerfully struck effort cannoned back off the crossbar, with Currid beaten. As the Republic celebrated their Centenary Shield triumph (and were presented with the trophy on the pitch) Scotland were left to reflect upon what might have been. They now face Wales at Palmerston on Thursday 19th April where a victory would see them finish second in the overall standings. TEAMS: Republic of Ireland: Houghton, Adigun, Rooney, Doyle, Regbah, Farren, Murphy(c), Ryan, Walsh, Kerrigan, Manning. Subs: McNicholas, Conway, O’Connor, Walker, Lee, Lotefa, Whelan. 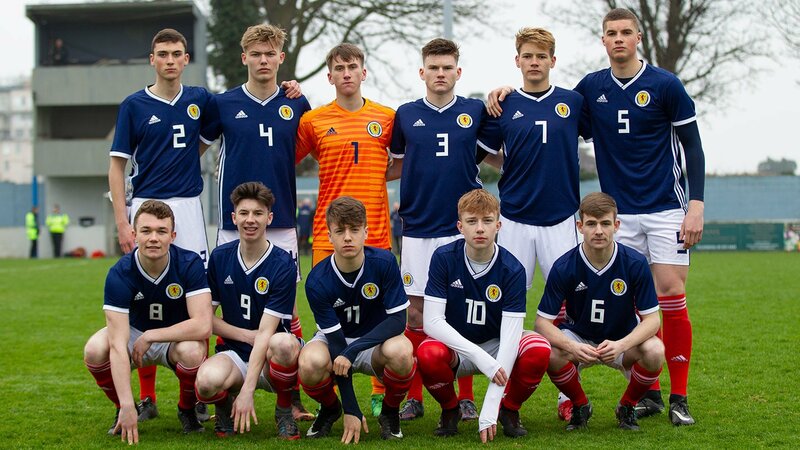 Scotland: Currid, McKeown, Clark, Brown, McDowall, Walsh (sub Harwood 82’), Walker (sub Fell 45’), Rintoull (sub Fagan 45’), Scott (sub Watt 74’), Hodge(sub Chalmers 45’), MacKay. Unused substitutes: Anderson (gk), Kemp. Scotland Captain Nathan Brown interviewed after the game.